Ever since I started playing Demi Lovato: Path to Fame I feel like DD and I are basically BFFs so I'm pretty pumped to hear her new album. Also I'm really into all the songs she's released leading up to it ("Confident" is my fave so far), so I'm psyched to hear the rest of the record. Carrie is my girl and I am so ready for this. Like she did with 2012's Blown Away, Carrie has co-written a whole bunch of the songs on her new album, which is really cool because that gives a personal touch to her songs that I think her fans really like (at least I do). Also there's going to be a song about her new baby on there so cue the cuteness. Literally obsessed with Little Mix and cannot wait to hear this sucker. Like I've been listening to "Black Magic" multiple times per day since it came out and the two new songs they just dropped are killer too. I am so down for the sound they seem to be going for and am super super excited to hear the whole enchilada come together. I've been a fan of Ellie's since I first heard her debut album, Lights, and it's been cool to see how she's evolved as an artist. Really interested to hear the stuff she did with Max Martin and what the general vibe of this album is going to be. Y'all know I love me some 1D, and I'm interested to hear what kind of sound they'll be going for on this new one. Will it be similar to Four and have that chill-rock vibe they were working? Or are they going in more of a pop direction? I mean I'll probably like it either way but I'll probably like it a teeny bit more if they go the pop route. And yes I am aware that the Biebs is also releasing his album on the same day and yes I will be listening to that as well. Everyone and their mother will be listening to Adele's new album, and that's why everyone else is releasing their albums before it drops. Also the fact that she's been working with Max Martin and Ryan Tedder makes me so happy it's not even funny. Literally cannot wait to hear this because it's going to be absolutely fantastic. 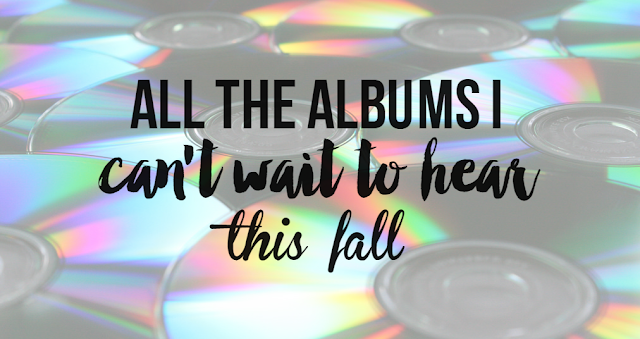 Which albums are you looking forward to this fall? Let me know so I can check them out!